One could also say every value is 21% or 1.21 times higher than the last, rounded to whole numbers. 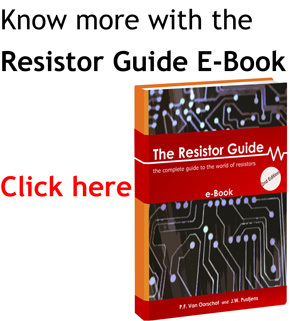 Because of this, all resistors with a tolerance of 10% overlap. The series looks as follows: 1– 1.2 – 1.5 – 1.8 – 2.2 – 2.7 – 3.3 – 3.9 – 4.7 – 5.6 – 6.8 – 8.2 – 10 etc. All these values can be powers of ten (1.2– 12 – 120 etc). E192 0.5% (also used for resistors with 0.25% and 0.1%). The E6 series has six values in each decade. The Tolerance is 20%. The E12 series is probably the most common series and exist for almost every resistor. The tolerance is ±10%. 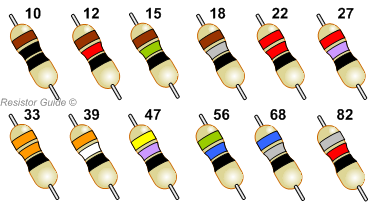 The E12 series of resistor values, including their color codes. Each decade is divided in 48 values. A third significant digit is added (just as for the E96 and E192 series).